Beach Candle Favors! Have guests take home a bit of the beach with these under-the-sea gel beach candles favors that double as wonderful table accents. 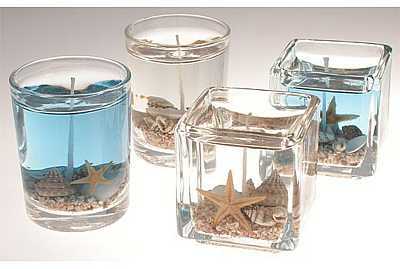 Seashells and starfish rest at the bottom on sandy pebbles inside each glass candleholder. Choose a round (1 7/8" diameter x 2 1/2" h) or square (2" x 2 1/4" h) holder with Clear (vanilla scent) or Blue (unscented) gel. Coordinates with our Beach Candle Centerpiece (sold separately). These make great beach wedding favors or bridal shower favors. Burns for approx. 18 hours. Price is per beach candle favor. Must order in increments of 4.